So this week the coat and scarf came out and as much as I am looking forward to autumn as I discussed recently, I won't be parting with SPF anytime yet.We all know to wear SPF in the sun, but it's not just for summer. I've never been the best at protecting my skin, but hid behind 'pale girl problems' as I'm not a sun-seeker and burn quite easily so have always kept in the shade. However, since hitting the big 3-0 last year I should try and act like a grown up and protect my skin more. I also introduced AHA's to my routine which I wrote about in this feature, so I've been making sure that if my base doesn't contain SPF that I put some on just in case. I've been wearing lighter coverage bases for most of the last couple of months and here's a few that I reach for almost daily and rely on to keep those harmful rays at bay. NARS Pure Radiant Tinted Moisturiser, AKA the mac-daddy of tinted moisturiser, has to get a mention. I tend to reach for this when I have a few flaws that need hiding but don't want full on foundation. I can normally get away with this without concealer as well. Not only does it make your skin look flawless without feeling like it's there, it offers SPF 30/PA++, which is the highest that I think I've ever seen in a makeup product. What more can you ask for? For a little less coverage I veer towards the Chanel Vitalumiere Aqua. Giving out a nice dose of dewy goodness, this little beauty contains SPF 15. I find this sinks so well into my skin and it feels incredibly light and not really there. I never thought that this would suit my skin as I always opted for heavier coverage, but now I much prefer a light-medium coverage foundation with concealer where I need it. The newest base launch from Chanel is the Les Beige All-In-One Healthy Glow Fluid which also offers SPF 15. 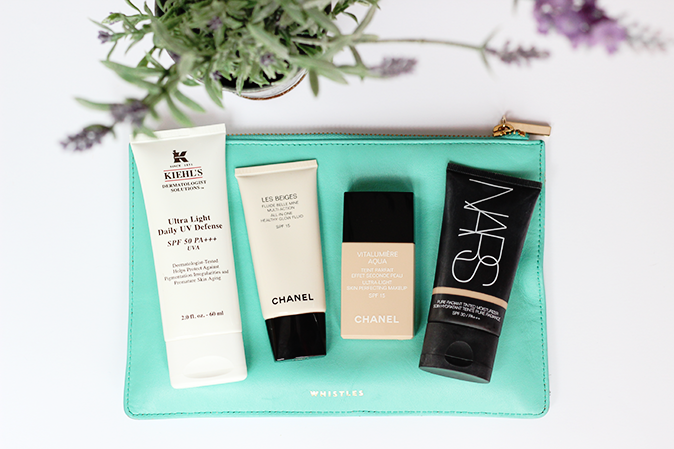 This is the lightest coverage of them all, reserved for the best skin days or if I want I really light dewy glow. It contains a hyaluronic acid derivative to help keep things moisturised and gives such a beautiful soft focus appearance to the skin. I've also got the powder from the same range which adds to the coverage if you need a little bit more. If all else fails and either I can't be bothered with base or if my skin needs extra coverage I've been using the Kiehl's Ultra Light Daily UV Defence SPF 50 PA+++. This offers super levels of protection and isn't thick or tacky. It sinks straight in and doesn't leave a white cast on the skin. If I wear foundation over the top it glides on and I don't need a primer. Sorted. I'm going to try my hardest to keep up the good work and protect my skin from now on. Do you wear SPF all year round or is it just a summer fling?